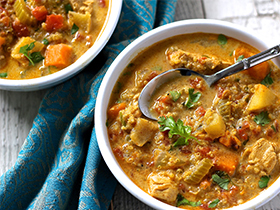 Get curried away with Greta’s scrumptious version of mulligatawny soup! Chicken, quinoa, veggies, warm spices and coconut milk make this hearty soup super-nutritious and super-flavourful. Melt butter in a large soup pot over medium heat. Add celery, onions, carrots and garlic. Cook and stir for 3 to 4 minutes, until vegetables begin to soften. Add chicken. Cook until chicken is no longer pink. Add gingerroot, curry powder, chili powder, cumin and cloves. Cook and stir for 1 more minute. Add broth, tomatoes, quinoa, salt and pepper. Bring to a boil. Reduce heat to medium-low. Cover and simmer for 15 minutes. Add apples. Simmer for 5 more minutes, or until apples are tender but not mushy. Stir in coconut milk and cilantro. Heat for 1 more minute. Serve hot.